After helping hundreds of large enterprises select technology over the past few decades, my colleague Jarrod Gingras and I learned some important lessons. 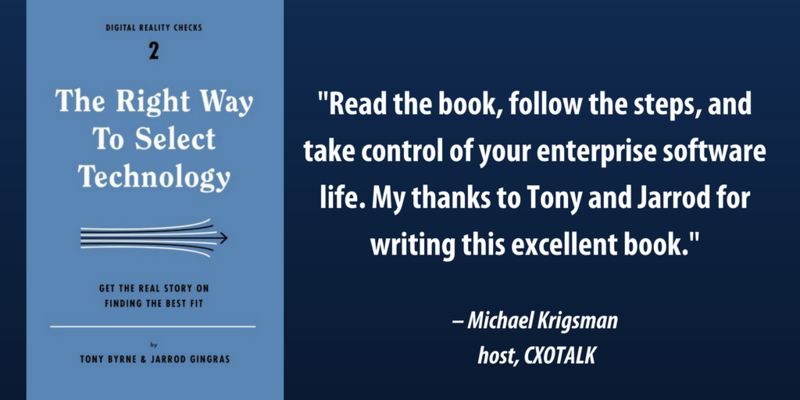 We captured those learnings in a book, "The Right Way to Select Technology" (Rosenfeld Media). Simply go here to obtain your authorization code, via corporate email address (registration required). Technology specialists at consultancies/agencies/integrators and vendors can order the book directly on Amazon. If you'd like to preview some key lessons from the book, check out our series of tech selection tips. We always welcome your feedback.